Of presumed autoimmune origin, multiple sclerosis (MS) is a chronic acquired inflammatory disorder of the central nervous system (CNS). Like most autoimmune disorders, MS is more prevalent in women and has a typical onset between the second and fifth decades. Although the etiology and pathogenesis remain largely unknown, MS is recognized as a consequence of complex host genetic and environmental factors resulting in immune-mediated CNS injury. Although many clinical subtypes are defined, biologically there are only 2 forms, relapsing and progressive. The immune system mediates much of the early injury and accounts for mechanisms underlying clinical relapses. In contrast, mechanisms of progression are less understood and may share similarities with other neurodegenerative disorders. 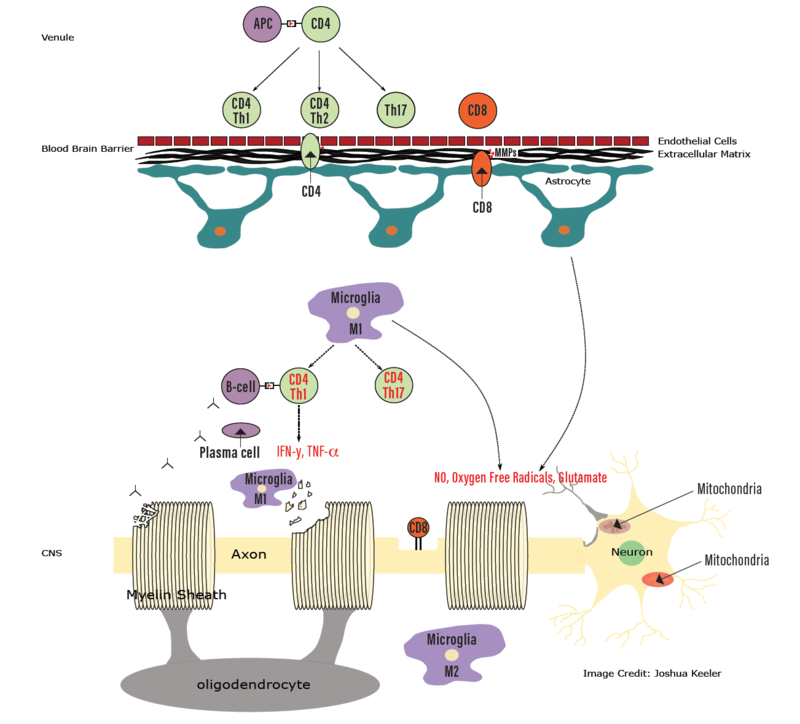 Much of the information on immune mechanisms that mediate injury to the CNS in MS comes from studies using the animal model of MS, experimental autoimmune encephalomyelitis (EAE). In early studies of rats with EAE, adoptive transfer of T lymphocytes but not non-T–cell fractions (B cells had not been discovered at that time) could transfer disease.5 As a result, T lymphocytes became the focus of research in MS to the exclusion of B cells. The classic model of T-cell mediated pathogenesis starts with T-lymphocyte activation in the systemic immune compartment, presumably by an inciting environmental factor, such as a virus. Development of immunity against the agent results in autoimmunity because of shared homology between viral antigens and proteins of the CNS. Thought to be the main culprits of immune mediated injury,2 T cells cross the blood-brain barrier (BBB), they are reactivated by antigen-presenting cells (APCs) expressing major histocompatibility class (MHC) II molecules (Figure). In the CNS these cells include microglia, macrophages, and B-cells. Studies in EAE have further identified the specificities of the CD4 cells. The pro-inflammatory CD4 cells belong to the Th1 or the Th17 subtypes, whereas the anti-inflammatory CD4 T cells belong to the Th2 subtype. These phenotypes are defined by the lymphokines they secrete. The Th1 cells secrete interferon γ and tumor necrosis factor-α (TNF-α) and are driven by the T-cell transcription factor TBET (initially termed T-box transcription factor). Th17 cells secrete interleukin (IL)-17 and are activated by IL23, secreted by the activated macrophages. Th2 cells are activated by the transcription factor GATA3, and secrete IL4, IL5, and IL10. Figure. Proposed model of Immunopathogenesis in MS. Activated by antigen-presenting cells, T cells and other inflammatory cells cross the blood-brain barrier and secrete MMPs that breakdown the extracellular matrix, allowing other inflammatory cells into the central nervous system where they release multiple factors (eg, antibodies, oxygen free radicals, tumor necrosis factor-a) that contributed to degeneration of myelin and axons. It was not until the unexpected success of rituximab, an antibody to CD20, that it became clear that B cells also played a significant role in the pathogenesis of MS.10 How B cells contribute to the pathogenesis of MS is largely unknown, however abundant evidence supports their role. Intrathecal IgG synthesis and presence of oligoclonal immunoglobulin bands in the CSF are found in over 85% of patients with MS. Evidence suggests antibodies with activated complement may contribute to myelin injury.11 Reduced antibody production by intrathecal B cells, however, does not appear to be the mechanism of action for anti-CD20 therapy because plasma cells do not express CD20, and penetration of monoclonal antibodies to CD20 into the intrathecal space is very limited. Outside the CNS, programmed B cells enhance autoreactive T-cell expansion by promoting antigen presentation to T cells, currently thought to be the main mechanism of action of anti-CD20 therapy—breaking this cycle to resume immunotolerance. Myelin oligodendrocyte glyocoprotein (MOG) induces disease in animals with EAE, but a role in patients with MS is less clear. The pattern of MOG-antibody associated disease is similar pathologically to a specific clinical subtype of MS (pattern II). However, clinically MOG antibody-associated disease is more similar to neuromyelitis optica (NMO) and may represent a different disease entity.14 Autoreactive axonal antigens, if any, have yet to be identified. The BBB is composed of the tight junctions between the post capillary endothelial cells, the astrocyte foot processes, and the extracellular matrix (ECM). All immune cells that traffic to the brain first interact with the postcapillary venular endothelium where cells are attached via interaction of very late antigen-4 (VLA-4; α4β1 integrin) molecules on the mononuclear cells with vascular cell adhesion protein 1 (VCAM1) .15 Cells are then internalized by the endothelium and extruded to the nonluminal perivenular space where they come in contact with the ECM. By secretion of matrix metallopeptidase 9 (MMP9), breakdown of ECM follows, and cells reach the CNS compartment. Breakdown of ECM is commensurate with breakdown of the BBB. Inflammation occurs as immune cells cross into the CNS across a leaky BBB. This is visualized clinically as gadolinium-enhancing lesions on conventional MRI. Interferon β and minocycline decrease production and function of MMPs and favorably influence relapses in MS.16 The importance of this early step is also highlighted by natalizumab efficacy for reducing clinical relapses and new lesion accumulation.17 Natalizumab is a humanized monoclonal antibody against the α4-integrin subunit of VLA-4 that blocks VLA-4 binding with VCAM-1 to reduce immune cell entrance, breakdown of the BBB, and overall CNS inflammation. In clinical practice, conventional MRI readily detects focal demyelination as increased T2/fluid-attenuated inversion recovery (FLAIR) signal in lesions; in contrast, axonal injury is only seen late in the process, when “black holes” emerge on T1 imaging. Reversible axonal injury or irreversible axonal transection can be detected by spectroscopy early, in normal appearing white matter using n-acetyl-aspartate, a marker produced exclusively in neuronal mitochondria. Brain atrophy, which is accelerated in MS, is a reflection of cortical neuron loss and white matter axon and myelin loss. Progressive MS is best defined as a decline in neurologic function in the absence of exacerbations.26 Primary progressive MS (PPMS) begins with progression without relapses and is experienced by 10% to 15% of all patients with MS. Affecting men and women equally, PPMS is a disorder that has a later onset. Spinal cord involvement is common, sometimes with no or nearly no brain lesions on MRI. When progression occurs in a person whose disease course previously included relapses, the disorder is described as secondary progressive MS (SPMS). 1. Bashinskaya VV, Kulakova OG, Boyko AN, Favorov AV, Favorova OO. A review of genome-wide association studies for multiple sclerosis: classical and hypothesis-driven approaches. Hum Genet. 2015;134(11–12):1143-1162. 2. Yadav SK, Mindur JE, Ito K, Dhib-Jalbut S. Advances in the immunopathogenesis of multiple sclerosis. Curr Opin Neurol. 2015;28(3):206-219. 3. Goodin DS. The epidemiology of multiple sclerosis: insights to disease pathogenesis. Handb Clin Neurol. 2014;122:231-266. 4. Wekerle H. Brain autoimmunity and intestinal microbiota: 100 trillion game changers. Trends Immunol. 2017;38(7):483-497. 5. Paterson PY. Transfer of allergic encephalomyelitis in rats by means of lymph node cells. J Exp Med. 1960;111:119-136. 6. Segal BM, Constantinescu CS, Raychaudhuri A, Kim L, Fidelus-Gort R, Kasper LH, et al. Repeated subcutaneous injections of IL12/23 p40 neutralising antibody, ustekinumab, in patients with relapsing-remitting multiple sclerosis: a phase II, double-blind, placebo-controlled, randomised, dose-ranging study. Lancet Neurol. 2008;7(9):796-804. 7. Buzzard KA, Broadley SA, Butzkueven H. What do effective treatments for multiple sclerosis tell us about the molecular mechanisms involved in pathogenesis? Int J Mol Sci. 2012;13(10):12665-12709. 8. Hauser SL, Oksenberg JR. The neurobiology of multiple sclerosis: genes, inflammation, and neurodegeneration. Neuron. 2006;52(1):61-76. 9. Farina C, Weber MS, Meinl E, Wekerle H, Hohlfeld R. Glatiramer acetate in multiple sclerosis: update on potential mechanisms of action. Lancet Neurol. 2005;4(9):567-575. 10. Hauser SL, Waubant E, Arnold DL, Vollmer T, Antel J, Fox RJ, et al. B-cell depletion with rituximab in relapsing-remitting multiple sclerosis. N Engl J Med. 2008;358(7):676-688. 11. 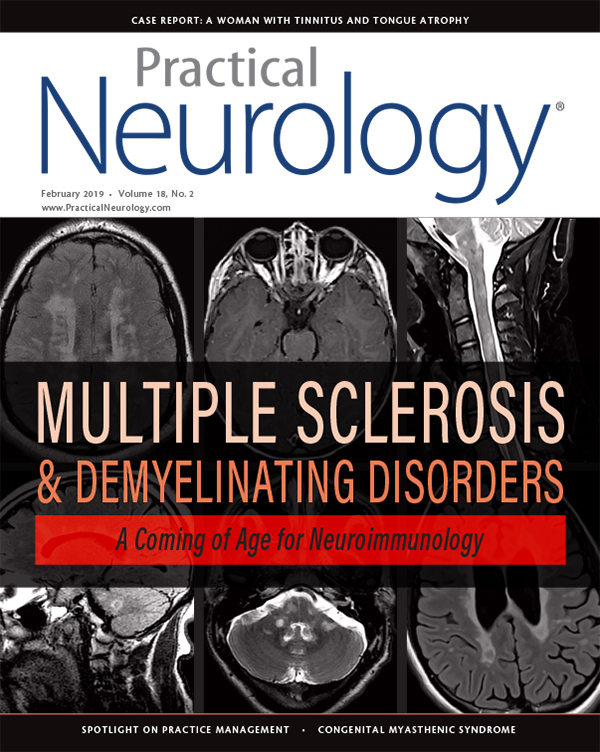 Pröbstel A-K, Sanderson NSR, Derfuss T. B cells and autoantibodies in multiple sclerosis. Int J Mol Sci. 2015;16(7):16576-16592. 12. Magliozzi R, Howell O, Vora A, Serafini B, Nicholas R, Puopolo M, et al. Meningeal B-cell follicles in secondary progressive multiple sclerosis associate with early onset of disease and severe cortical pathology. Brain J Neurol. 2007;130(Pt 4):1089-1104. 13. Stern JNH, Yaari G, Vander Heiden JA, Church G, Donahue WF, Hintzen RQ, et al. B cells populating the multiple sclerosis brain mature in the draining cervical lymph nodes. Sci Transl Med. 2014;6(248):248ra107. 14. López-Chiriboga AS, Majed M, Fryer J, et al. Association of MOG-IgG serostatus with relapse after acute disseminated encephalomyelitis and proposed diagnostic criteria for MOG-IgG–associated disorders. JAMA Neurol. 2018;75(11):1355-1363. 15. Sallusto F, Impellizzieri D, Basso C, Laroni A, Uccelli A, Lanzavecchia A, et al. T-cell trafficking in the central nervous system. Immunol Rev. 2012;248(1):216-227. 16. Metz LM, Li DKB, Traboulsee AL, et al. Trial of minocycline in a clinically isolated syndrome of multiple sclerosis. N Engl J Med. 2017;376(22):2122-2133. 17. Brandstadter R, Katz Sand I. The use of natalizumab for multiple sclerosis. Neuropsychiatr Dis Treat. 2017;13:1691-1702. 18. Shimizu F, Ransohoff RM. GRP78 autoantibodies initiate the breakdown of the blood-brain barrier in neuromyelitis optica. Oncotarget. 2017;8(63):106175-106176. 19. Barnett MH, Parratt JDE, Cho E-S, Prineas JW. Immunoglobulins and complement in postmortem multiple sclerosis tissue. Ann Neurol. 2009;65(1):32-46. 20. Lucchinetti CF, Popescu BFG, Bunyan RF, Moll NM, Roemer SF, Lassmann H, et al. Inflammatory cortical demyelination in early multiple sclerosis. N Engl J Med. 2011;365(23):2188-2197. 21. Lassmann H, van Horssen J, Mahad D. Progressive multiple sclerosis: pathology and pathogenesis. Nat Rev Neurol. 2012;8(11):647-656. 22. Trapp BD, Peterson J, Ransohoff RM, et al. Axonal transection in the lesions of multiple sclerosis. N Engl J Med. 1998;338(5):278-285. 23. Deb C, Lafrance-Corey RG, Schmalstieg WF, Sauer BM, Wang H, German CL, et al. CD8+ T cells cause disability and axon loss in a mouse model of multiple sclerosis. PloS One. 2010;5(8):e12478. 24. Hickman S, Izzy S, Sen P, Morsett L, El Khoury J. Microglia in neurodegeneration. Nat Neurosci. 2018;21(10):1359-1369. 25. Coman I, Aigrot MS, Seilhean D, Reynolds R, Girault JA, Zalc B, et al. Nodal, paranodal and juxtaparanodal axonal proteins during demyelination and remyelination in multiple sclerosis. Brain. 2006;129(12):3186-3195. 26. Lublin FD, Reingold SC. Defining the clinical course of multiple sclerosis: results of an international survey. National Multiple Sclerosis Society (USA) Advisory Committee on Clinical Trials of New Agents in Multiple Sclerosis. Neurology. 1996;46(4):907-911. 27. Iwanowski P, Losy J. Immunological differences between classical phenothypes of multiple sclerosis. J Neurol Sci. 2015;349:10-14. 28. Trapp BD, Stys PK. Virtual hypoxia and chronic necrosis of demyelinated axons in multiple sclerosis. Lancet Neurol. 2009;8(3):280-291.